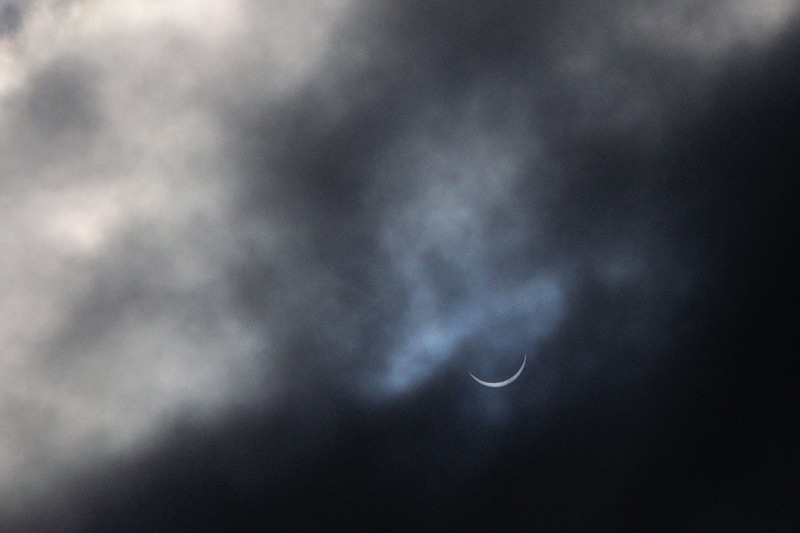 Mid-eclipse, captured through clouds in Edinburgh. 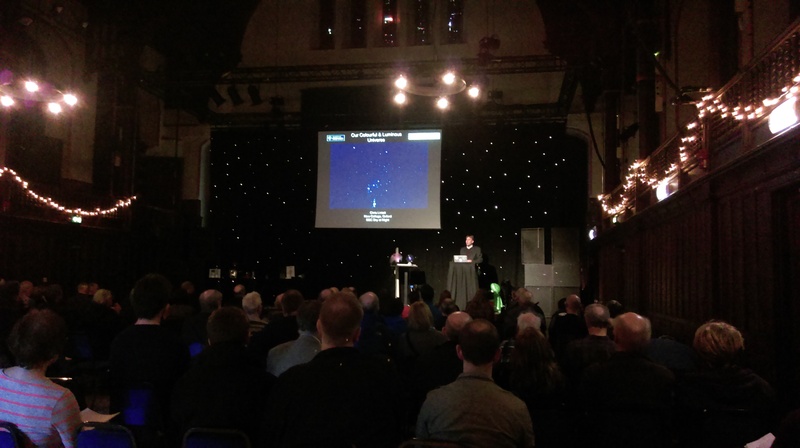 Chris Lintott starting his talk on ‘Our Colourful and Luminous Universe’ at Science and Magic of Light, the Universe and Everything 2015. A member of the public perusing the ASE’s display. Science and Magic of Light, the Universe and Everything on 28th March 2015 was billed as a warp speed tour of our amazing universe led by world leading scientists and magicians. The day of free talks, demos and discussions took place at Edinburgh University Debating Hall in Bristo Square, and was intended to be suitable for all ages. 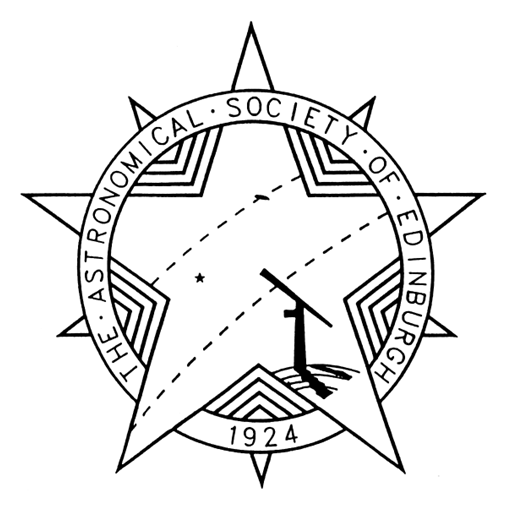 This is, I believe, the third such day of astronomy talks organised by Astronomer Royal for Scotland, Professor John Brown, Lorna McCalman and Charlie Gleed which the ASE have been involved in, and was a great success in celebrating the International Year of Light 2015. 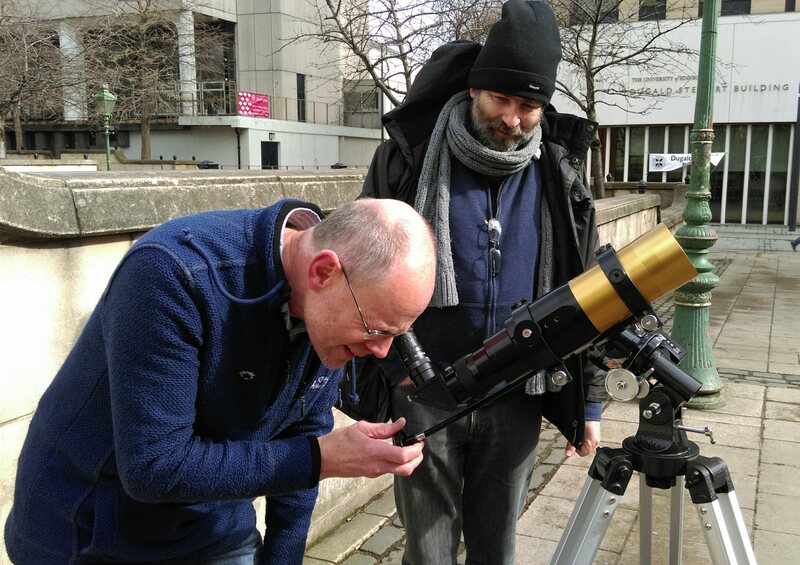 During the course of the day there were talks by astronomers Prof. John Brown, Prof. Colin McInnes, Prof. Martin Hendry and Prof. Chris Lintott, while magicians Euan Callison, Kevin McMahon and, of course, our Astronomer Royal John Brown injected some magic into the event. The talks were brilliant and the magic engaging. I noted a number of serious astronomers cracking a smile at various points, not least when poor Chris Lintott was attacked by Zurg the naughty Alien! 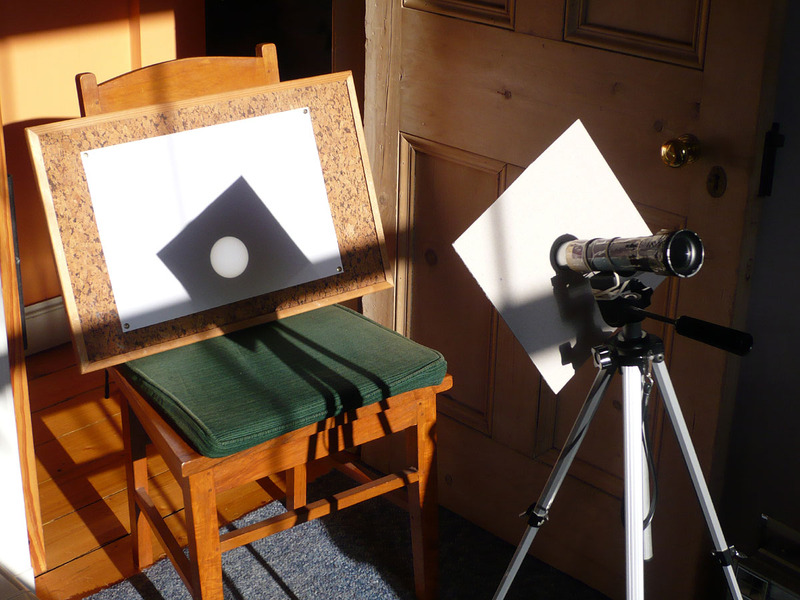 Ken and Horst align the Society’s solar telescope. Alongside the event, there were planetarium shows being run throughout the day by Cosmos Planetarium, Jamie Shepherd had again come along with his impressive collection of meteorites, and the ASE were out in force with a display set up in the foyer outside the Debating Hall. We had the usual information and hand-outs available, as well as a couple of telescopes on show and a number of members available to talk to interested parties. 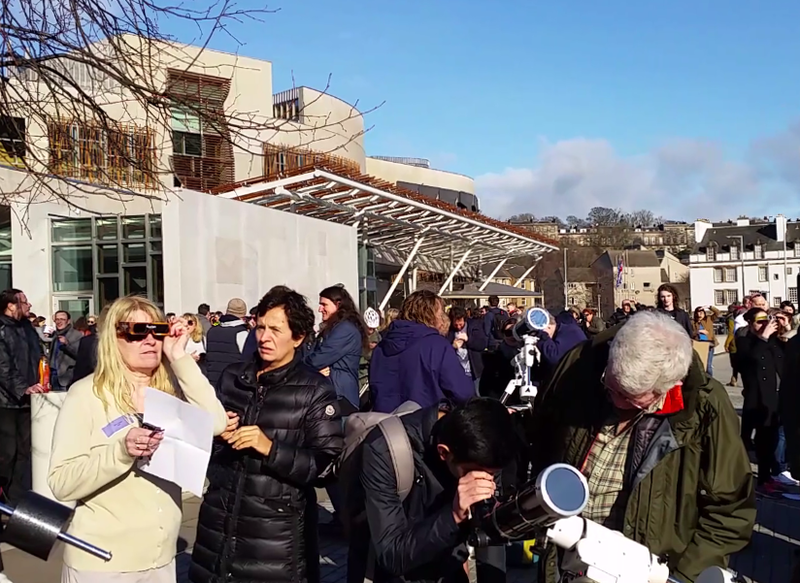 We had a great turn out which meant that there was always someone available to look after the telescopes and display while other members listened in to the various talks, or took the solar telescope outside to attempt some solar observing during breaks in the clouds. The good turn-out of members not only meant that we were all able to take breaks from engaging with the public to listen in to the talks or go for lunch, but it also meant that we had a great group of like-minded people to discuss the content of the talks with, as well as any other topics which came up. I very much enjoy doing outreach and sharing my love of astronomy with others, but it is always better with friends. Being in the ASE has a lot of benefits, but the friendship with others who share your passion is one of the best things for me, as I know that I will always have a great time when there are other members involved. ASE members with Prof. Chris Lintott, current president Ken Thomas, and honorary presidents Prof. Andy Lawrence & Prof. John Brown. 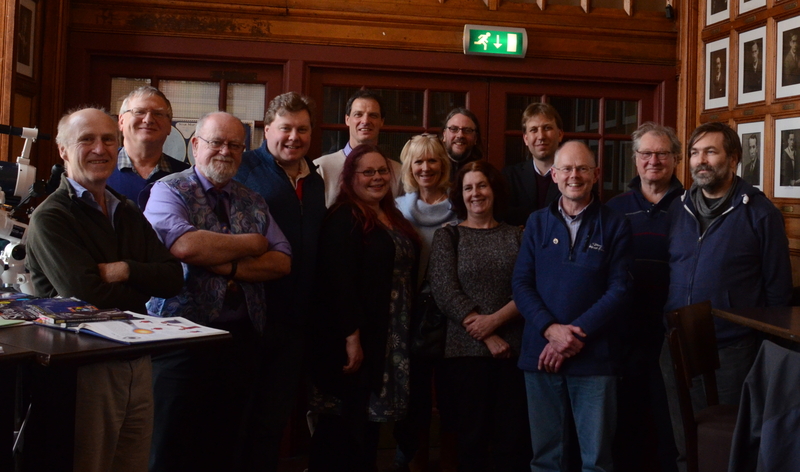 Science and Magic of Light the Universe and Everything was a great day of talks, an excellent chance to spend the day with other astronomers from all over the country, and to round it off, the ASE contingent even managed to get a group photo with Chris Lintott! 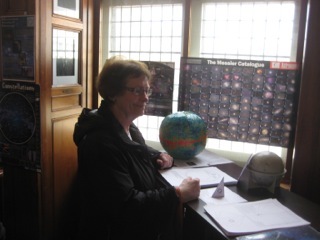 Rachel has been a member of the Society for over 10 years, and during that time has been actively involved in most of the public outreach events attended or organised by the ASE. She is currently on the Council, Tweets for the Society, and reinvented the Journal into its current online presence in 2013. Spring may have arrived, but the leading constellation of our winter sky, Orion, is still on view in our early evening sky, if not for very much longer. 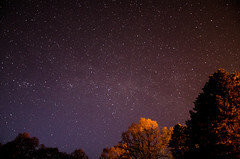 Look for it in the south-west at nightfall, with the three stars of his Belt lying almost parallel to the horizon. Stretch their line to the left to reach Sirius in Canis Major, our brightest nighttime star, and to the right towards Taurus, with its bright star Aldebaran and the Pleiades star cluster. 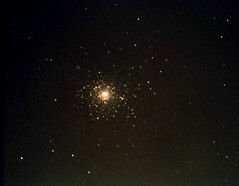 High in the south-south-west is Gemini, with the twins Castor and (slightly brighter) Pollux. 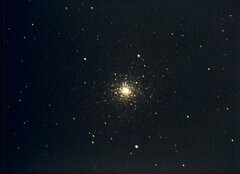 To the south of Gemini is Procyon, the Lesser Dog Star in Canis Minor. Together with the true Dog Star, Sirius, and the distinctive red supergiant Betelgeuse at Orion’s top-left shoulder, Procyon completes an almost-isosceles triangle which we dub “The Winter Triangle”. At present, in fact, it forms a similar but smaller triangle with Pollux and the conspicuous planet Jupiter which dominates our southern sky at nightfall. Leo stands to the left of Jupiter with its leading star, Regulus, in the handle of the Sickle. The Sun climbs more than 10° northwards during April and sunrise/sunset times for Edinburgh change from 06:44/19:50 BST on the 1st to 05:32/20:49 on the 30th. Meanwhile, the duration of nautical twilight at the start and end of the night stretches from 84 to 105 minutes. The Moon is full on the 4th when a total lunar eclipse is visible from the Pacific and surrounding areas but not from Europe. In fact, totality, with the moon just inside the northern part of the Earth’s dark umbral shadow lasts for a mere 4 min 34 sec centred at 13:00 BST, making this the briefest total lunar eclipse for 486 years. 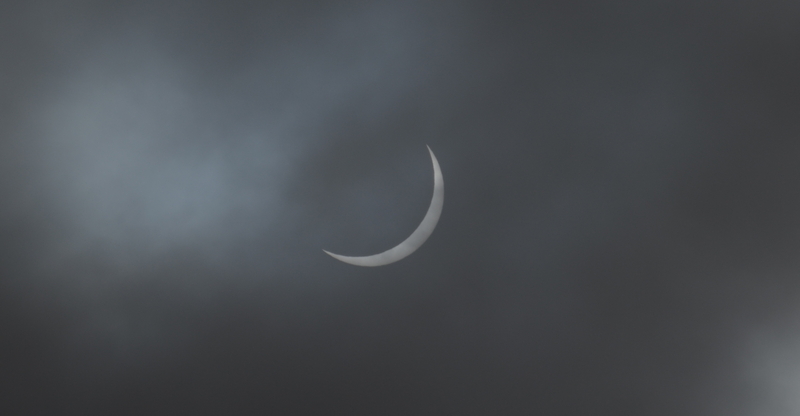 By comparison, totality lasts for 72 minutes during the next total lunar eclipse which is visible from Scotland on the morning of 28 September this year. The Moon’s last quarter on the 12th is followed by new moon on the 18th and first quarter early on the 26th. By nightfall on the 26th, that first quarter Moon lies 6° below Jupiter in the south-south-west. Jupiter, itself, dims a little from magnitude -2.3 to -2.1 and is slow-moving in Cancer 5° to the left of the Praesepe cluster in Cancer. 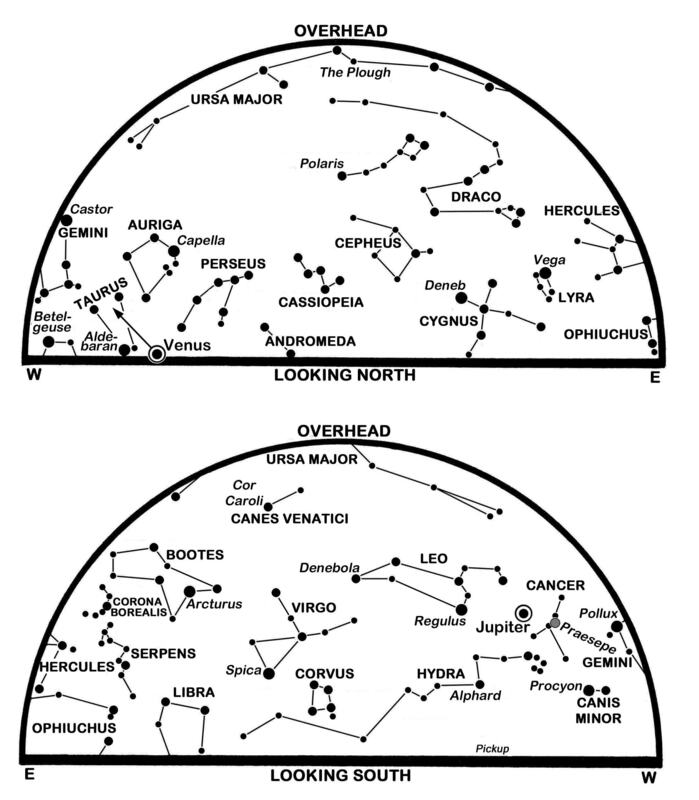 The star cluster is best seen through binoculars which also show the changing positions of the four main Jovian moons as they swing from side to side of the planet. The giant planet progresses into the south-west by our star map times and sets in the north-west more than five hours later. Even though Jupiter is twice as bright as Sirius, it pales by comparison with the evening star Venus which blazes brilliantly in the west at nightfall, and sets at Edinburgh’s west-north-western horizon by 23:38 BST on the 1st and in the north-west as late as 01:08 on the 30th. This month Venus approaches from 180 million to 150 million km and swells in diameter from 14 to 17 arcseconds, its dazzling disk appearing gibbous through a telescope as its phase changes from 78% to 67% illuminated. Venus also speeds eastwards during the period, moving from Aries to Taurus where it passes 2.7° south of the Pleiades on the 11th to end April 3° south of Elnath at the tip of the Bull’s northern horn. There should be an impressive sight on the evening of the 21st when Venus lies 7° above-right of the earthlit crescent Moon which, in turn, is 2.5° above-left of Aldebaran. Mars, magnitude 1.4, is low and hard to spot in our western evening twilight, becoming lost from view later in the month as it tracks towards the Sun’s far side. However, after passing beyond the Sun at superior conjunction on the 10th, Mercury emerges in our twilight to begin the innermost planet’s best evening apparition of the year. 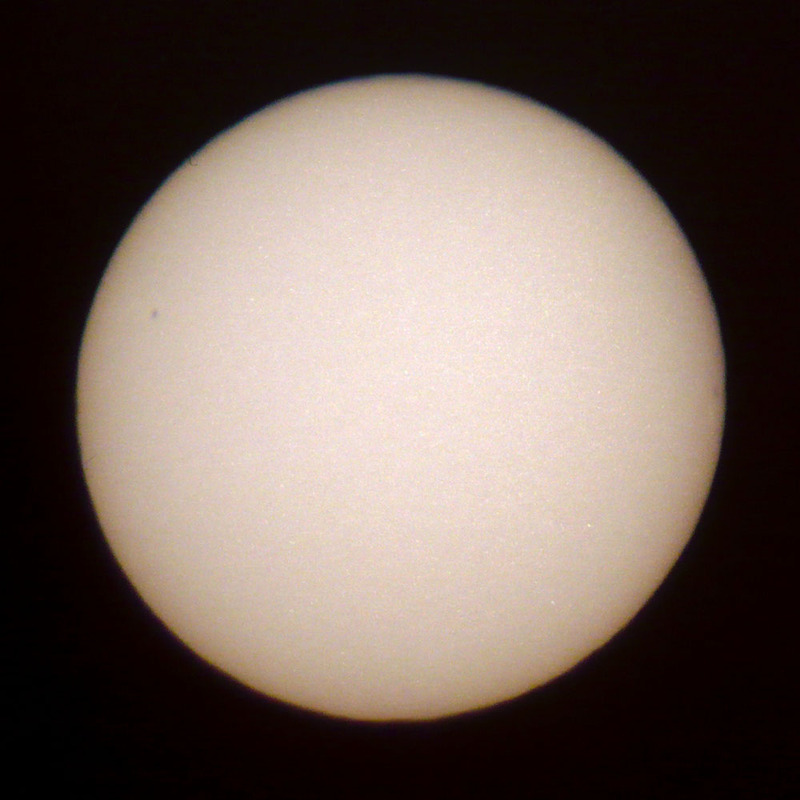 On the 19th, Mercury shines at magnitude -1.3 and stands 4° high in the west-north-west forty minutes after sunset. Mars lies 2.8° above and to its left while the sliver of the earthlit Moon is 12° high and to their left. By the month’s end Mercury is 10° high forty minutes after sunset and shines at magnitude -0.4 22° below and to the right of Venus and only 1.7° below-left of the Pleiades. Binoculars may help to pick it out at first but it should emerge as a naked-eye object as the twilight fades and it sinks to the north-western horizon by 23:00. Saturn is on show during the second half of the night though it does not climb far above our horizon so is not well placed for the sharpest views of its stunning ring system. For Edinburgh, it rises in the south-east at 00:46 on the 1st and by 22:40 on the 30th, reaching its highest point of 15° in the south four hours later before dawn. Shining at magnitude 0.3 to 0.1, Saturn lies in Scorpius where it creeps 1.5° westwards above the double star Graffias. 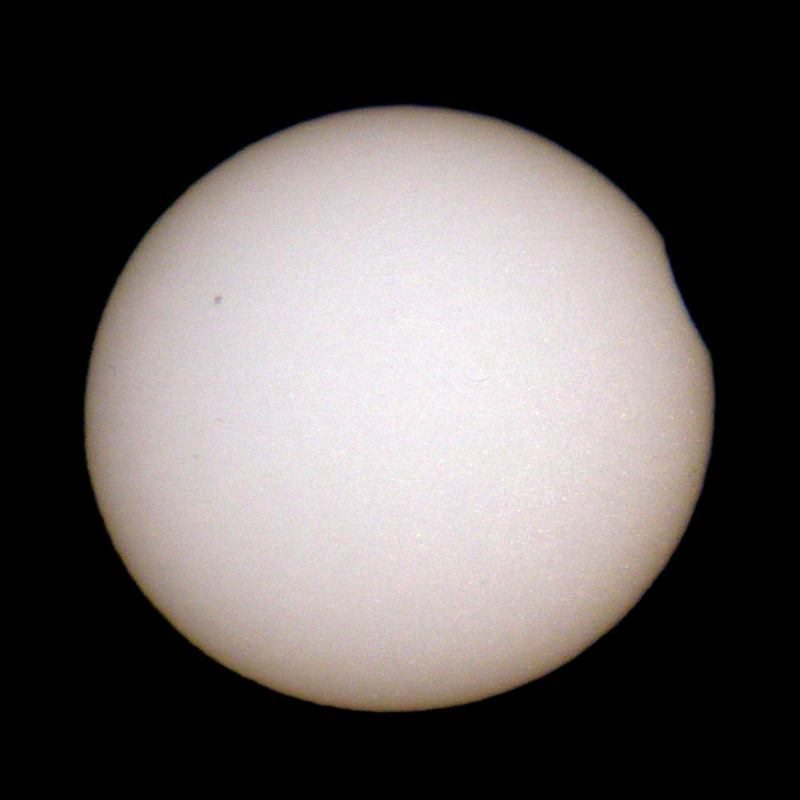 As it lies below and left of the Moon on the 8th, a telescope shows the planet’s rotation-flattened disk to be 18 arcseconds wide, within rings that span 41 arcseconds and have their northern face tilted Earthwards at 25°. Although they show an amazing complexity on the small scale, the main rings, dubbed A and B, are separated by the relatively empty dark arc of the Cassini Division. B, the brightest of the rings, has A outside it and the dusky C ring within. This is a slightly-revised version of Alan’s article published in The Scotsman on March 31st 2015, with thanks to the newspaper for permission to republish here.